A homonymous hemianopia is the loss of part of the field of view on the same side, in both eyes. It occurs frequently in stroke and traumatic brain injuries due to the way vision is represented in the brain. The visual images that we see to the right travel from both eyes to the left side of the brain, while the visual images we see to the left in each eye travel to the right side of the brain. Therefore, damage to the right side of the posterior portion of the brain can cause a loss of the left field of view in both eyes. Likewise, damage to the left posterior part of the brain can cause a loss of the right field of vision. The most common causes of this damage include stroke, brain tumour and trauma. 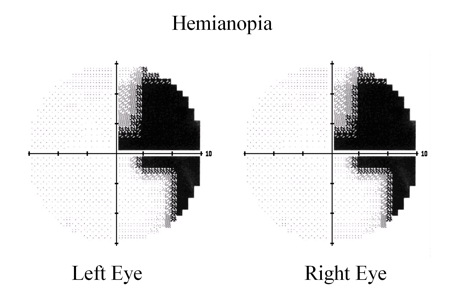 These are the visual fields of a patient with a right-sided hemianopia tested on a machine called a Humphrey Field Analyser. Each eye is tested in turn. The patient looks ahead at a point represented by the cross hair while lights are flashed to the left or right. The patient has to press a button when they see a light. When they consistently miss lights in certain parts of their field, it is recorded as a dark patch. Notice that the fields are very similar in both eyes because hemianopia is not caused by eye damage. Although the missing field is represented as black here, this is not how patients with hemianopia experience their visual loss. You cannot see behind you without moving your head and eyes, but you do not experience this lack of vision as a blackness. The same is true of patients with hemianopia. A homonymous hemianopia can affect a patient’s independence. Patients report fear of running into objects, tripping, falling, knocking over drinks, and being startled by objects or people that suddenly appear out of nowhere. Patients may become so fearful of falling or running into objects that they may be unwilling to travel or shop without assistance. Panic attacks may even occur when in crowded stores, because homonymous hemianopia patients can easily become lost, feel disoriented and unable to navigate safely through the crowd. Patients are often much slower when reading text, because they cannot see the upcoming words. Some patients fearing both embarrassment and the danger of injury may continue to withdraw socially. Patients may mistakenly believe that the loss of vision is just in one eye. They may report “my right eye has been bad since the stroke”, while actually the damage in the brain caused a loss in both eyes. Patients with hemianopia also may fail to fully report the degree of their visual disability.